As I blogged in the past, the desktop virtualization market is growing very rapidly but we are still in the early stages. At VMware we are blessed to have a very large customer base who seem to really like us and root for us. We never take it for granted. They have been on a journey with us on the server side and an increasing number of them are undertaking the journey on the desktop side as well. Last year we saw a big increases in pilots and POCs which is still continuing today, but of course the more exciting part is seeing customers deploying VMware View in mission critical end user scenarios. Although this is still an early markets where it is typically hard(er) to get customers to openly speak about their successes, we are very proud of our significant roster of public references in the 1000s os seats and I talked about in this earlier post. In the coming weeks, I will write about more recent customer deployments. In this post I want to help customers and prospects who are considering VDI by sharing some market research data that we collected in 2010. 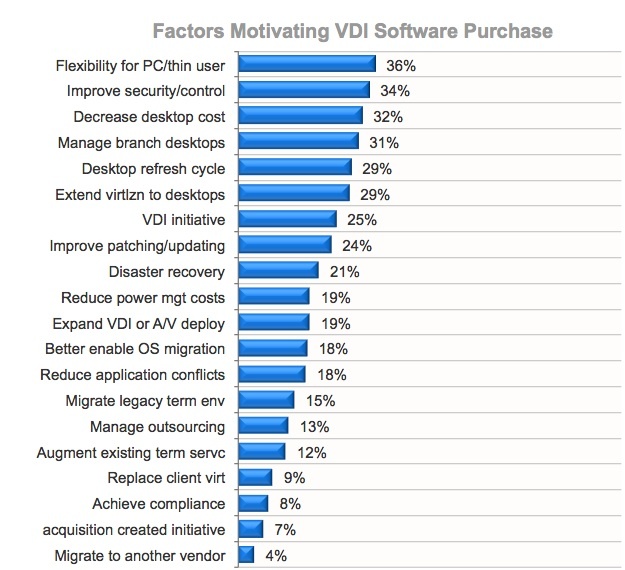 This data was collected from on a blind sample of statistically significant number of VDI users. No big surprises here, other than I would have thought security would be the biggest driver. 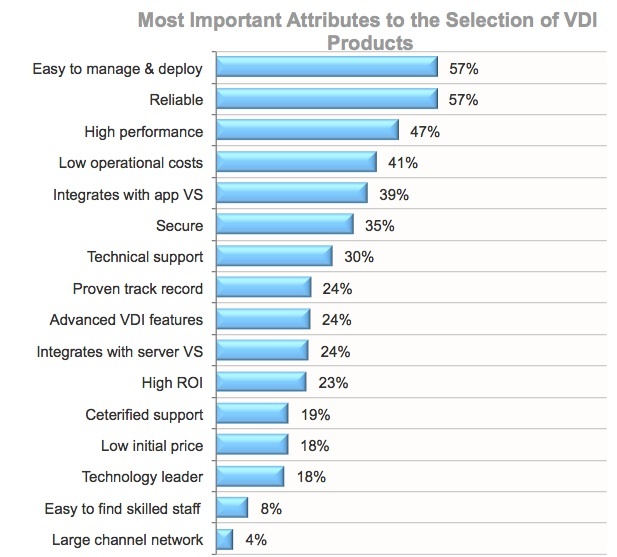 These are the most important attributes that prospects and customers consider important when selecting a VDI solution. This aligns perfectly with the development philosophy at VMware: quality, performance and reliability are paramount. We will always trade off extra features for quality, easy of management and scalability. This is one of the reason who made VMware View 4.5 the eWeek 2010 product of the year and what is makeing the View Client for iPad a big success. View 4.5 in particular significantly raised the bar in terms of ease of deployment and management with a brad new sleek and unified management console and unprecedented low cost of acquisition thanks to the newly introduced tiered storage architecture. Wow. Sure is nice to hear a vendor blogging about information I can use instead of spewing venom.